Centuries ago, the Tuscarora Indians roamed the inner coastal plains of North Carolina, as did other Indian tribes. The Tuscarora were the largest and the strongest. When English settlers arrived in the North Carolina colony, it is reported the Indians — for the most part — were friendly to them. After about 50 years, their feelings toward the white man had changed. The white man had begun to encroach on their land, often practiced unfair trade with Indians and sometimes kidnapped and sold Indian women and children into slavery. In retaliation for this long-time treatment, the Tuscarora Indians met in secret with other tribes in Eastern North Carolina to plan attacks against the white man’s settlements. In the fall of 1711, the colony was in a sad state of affairs as a result of religious and political turmoil in the colony, drought and outbreak of disease. It was then the Indians attacked along the Neuse, Trent and Pamlico rivers, slaughtering settlers in a most violent manner. The Indian uprising led to the Tuscarora War, a vicious and violent time that lasted for several years. After the death and enslavement of hundreds of people, the Indians were defeated in a battle near Snow Hill at Fort Nooherooka and all Indians were sent to reservations in Bertie and Hyde counties. Many of the Tuscarora eventually began to migrate out of the state to an area near Niagara, N.Y., and joined the Five Nations of the Iroquois Confederacy. The Tuscarora became the Sixth Nation. There is a lot more to their story, but I am now going into a different direction with mine — now stepping back in time to the Civil War. Sometimes war produces unintended, but deeply meaningful ironies. One example in the distinguished history of American Indian military service during the Civil War was the career of the 132nd New York Regiment Company D, known as the Tuscarora Company. Ironically, the Tuscarora Company found itself stationed in North Carolina from which the Tuscarora people had left more than 140 years earlier as a result of defeat and dissatisfaction. The Tuscarora Company took part in the engagements at Pollocksville, Trenton, New Berne, Blount's Creek, Batchelder’s Creek, Southwest Creek, Jackson's Mill, Gardner's Bridge and in the campaign of the Carolinas at Wyse's Forks and Snow Hill. The severest loss sustained by the regiment was at the Battle of New Berne in February 1864. They suffered about 91 killed, wounded and missing. Company D shared in the credit with saving New Berne from capture. In March 1865 on the eastern side of Lenoir County, about 6 miles from Kinston, a three-day battle took place in the Wyse Fork community. About 20,000 soldiers were engaged on the Wyse Fork Battlefield. That is approximately how many people live in Kinston today. The Tuscarora Company fought on that battlefield. A partnership between ECU, the Tuscarora Indians and land owner George Mewborn were formed to commemorate the Tuscarora Indians from 300 years ago in North Carolina. 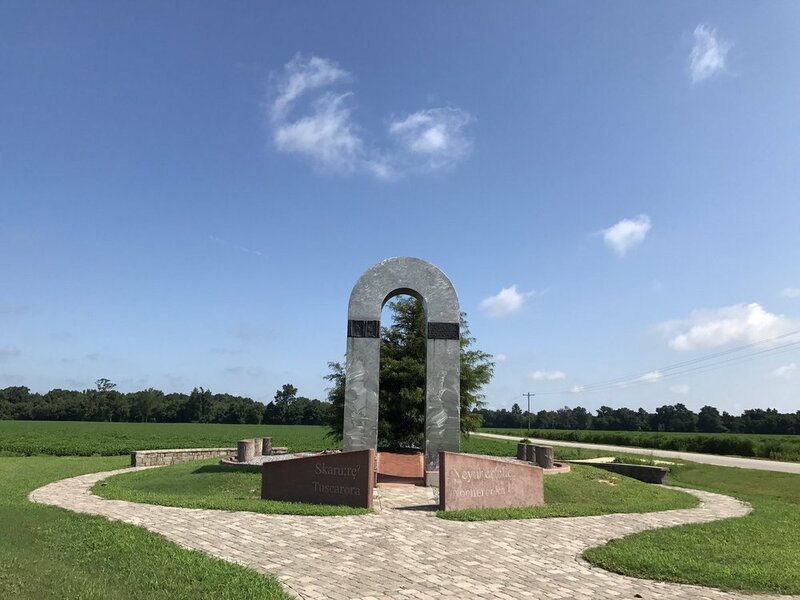 A memorial site was planned to be on a site next to Highway 258 near Snow Hill, near where the Fort Neoheroka Battle took place. Mewborn donated the land for the site. Famous sculptors Jodi and Hanna Jubran were commissioned to create a monument to honor the Tuscarora. ECU coordinated most of the activities that took place that week. 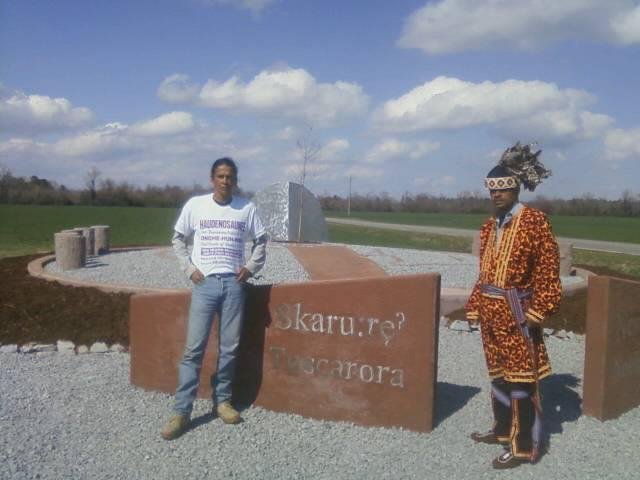 In March 2013, four to five busloads of Tuscarora Indians arrived from New York and many N.C. Tuscarora Indians also were present for the opening of the Tuscarora Memorial. Once again, the Tuscarora Indians had returned to the home land of their ancestors. My daughter and I attended the impressive ceremony and found it fun as we mingled with the crowd and spoke with the Indians. Some of the Tuscarora were in Indian dress and very colorful. Some of the young Indians played Indian games near the site. For the Tuscarora Indians the last 300 years brought defeat at Ft. Nooherooka, then victory during the Civil War and now the coming together in respect. We were excited and honored to have witness the return of the Tuscarora and the healing of bitter times in our history. Long may there be friendship between all peoples.